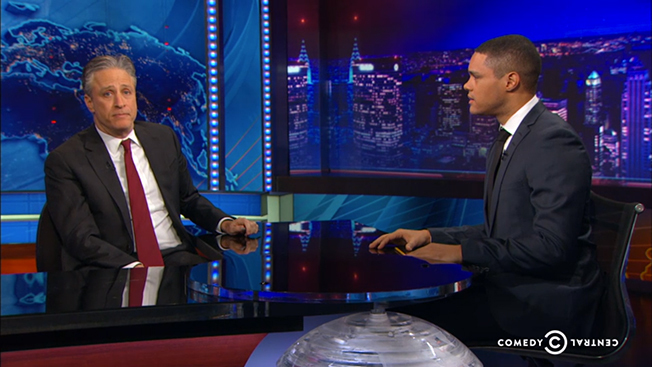 So Who Is Trevor Noah, the Guy Replacing Jon Stewart on The Daily Show? Trevor Noah is not a household name, or at least he wasn't yesterday. The comedian has been a Daily Show contributor for all of three months, and now he's taking over the whole thing when Jon Stewart departs "sometime later this year," in the words of Comedy Central president Michele Ganeless. But the network is confident it has the right person for the job. "He's extraordinary," Ganeless said. "Do yourself a favor and watch some of his stand-up. He brings a truly layered take on the world both because of his upbringing, but also because he works everywhere and does stand-up everywhere." The South African comedian's mother is Xhosa; his father is white. Their relationship was illegal when Noah was born, and his mother was punished for it more than once. Noah talked about it in his show Born a Crime and on the Laughspin podcast embedded below (we've cued it up to Noah talking about his ancestry, but the whole thing is worth a listen). The Daily Show is not a house that has taken to new residents easily—at least it didn't when Stewart came on board. When the comedian replaced Craig Kilborn, he famously didn't get along with the incumbent writing staff. "What I did not realize is, a lot of the people who worked there were assholes," Stewart said a couple of years ago. Ganeless said the total reverse is true with Noah: "There's a bit of a love fest going on," she said. "He loves working with them [the staff] and they love him. He's incredibly charming and engaging, and I just cannot tell you how hard we all laughed watching him." Ganeless said the show was looking less for an "it" factor and more for a clear voice and stamina. "You have to have the ability to innovate and reinvent because you're doing 160 shows a year, and you're talking about the same topics again and again and coming up with new takes," she said. "You're also helping the world understand [news] through comedy. That's not something you can test for." Noah is young—31, six years younger than Stewart was when he took the position. But Noah seems to get along with the crew, he has a wealth of experience in stand-up comedy, and he answers the pleas of Daily Show devotees to hire someone other than a straight, white man. Now, we'll see if those people are still willing to tune in when Stewart heads out.